There are several reasons why you might need to drain a hot tub, and there are many ways of draining a hot tub, too. You can use a submersible pump to drain the hot tub or use the in-built nozzles to let the water out of the bottom of the hot tub. As with all draining tasks, you must make sure that the hot tub is completely dry before you refill it or try to move it. Hot tubs need to be drained now and then as the water in the hot tubs can get chemically imbalanced after constant use. If the color of the water is dirty or there is debris floating in the hot tub, you should consider draining it immediately. There are many reasons why you might need to drain your hot tub. Here’s a look at some of these reasons. Hot tub Rash or Hot Tub Folliculitis is one of those concerning things that occur because of poor maintenance of hot tubs or spas. Just put together, it is the rash that is caused by soaking in contaminated water. The hot tub rash is not limited to happen only through hot tubs but of course, can happen anywhere like in swimming pool or lake or even beaches where the water is contaminated. A hot tub should be drained on every 2-4 months, depending on how much use it gets. But if you’ve had a weekend hot tub party or if there is a chemical imbalance in your hot tub, you should drain it and fill it up with fresh water. To make full use of your hot tub, you also need to maintain it and you will need to drain the hot tub from time to time. There are many ways of draining the hot tub and in this article, we are going to take a look at some of these methods and discuss how to drain a hot tub properly with a method that is quick and efficient. How Much Does a Hot Tub Weigh? 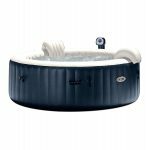 Hot tubs are available in all kinds of shapes and sizes. 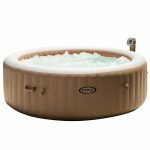 There are small inflatable hot tubs that are ideal for 2-4 people and large swim spas that allow you to practice swimming strokes in the jet flow of the water. When looking to buy a hot tub, the most common question that most prospective buyers ask is how much does the hot tub weight? Relaxing in a hot tub is one of the best ways to get rid of stress and tensions of the day. The added physical benefits of soaking in a hot tub are that you can sleep better, your skin gets a healthy glow, and minor body aches and pains simply disappear. If you want to use your hot tub in all seasons, then investing in a hot tub enclosure or a hot tub gazebo should be the ideal choice for you. Hot tub enclosures can be placed around the hot tub to protect it from the elements so that you can enjoy the hot water in privacy and comfort. Get updates related to Hot tubs.